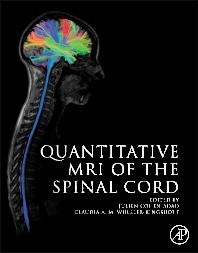 Quantitative MRI of the Spinal Cord is the first book focused on quantitative MRI techniques with specific application to the human spinal cord. This work includes coverage of diffusion-weighted imaging, magnetization transfer imaging, relaxometry, functional MRI, and spectroscopy. Although these methods have been successfully used in the brain for the past 20 years, their application in the spinal cord remains problematic due to important acquisition challenges (such as small cross-sectional size, motion, and susceptibility artifacts). To date, there is no consensus on how to apply these techniques; this book reviews and synthesizes state-of-the-art methods so users can successfully apply them to the spinal cord. Quantitative MRI of the Spinal Cord introduces the theory behind each quantitative technique, reviews each theory’s applications in the human spinal cord and describes its pros and cons, and suggests a simple protocol for applying each quantitative technique to the spinal cord. Part I Quantitative Biomarkers in the Spinal Cord: what for? 1.3A.4 Message 3: MRI Signal Characteristics after Acute Traumatic Spinal Cord Injury: What is the Sensitivity and Specificity of Determining Neurologic Function at the Time of Injury and for Predicting Long-Term Prognosis? 3.6.6 What Should We Measure? 4.2.1 What is Physiological Noise? 4.3.4 Inlet Arteries or Outlet Veins? Dr. Cohen-Adad is developing advanced magnetic resonance imaging (MRI) techniques for quantitative assessment of the brain and spinal cord structure and function. These developments include hardware (coils), MRI sequences (relaxometry, diffusion tensor imaging, magnetization transfer, functional MRI) and software (multimodal registration, segmentation, motion correction, distortion correction, template creation). Between 2005 and 2008 he did his PhD at Université de Montréal (Canada) and Pitié-Salpétrière Hospital (Paris, France), during which he translated research protocols to clinics for the quantitative evaluation of chronic spinal cord injury and amyotrophic lateral sclerosis patients. Between 2009 and 2012, he did his postdoctoral fellowship at the MGH Martinos Center at Harvard University, aiming to further his expertise in Ultra-High Field MRI technology (7 Tesla) and coil building. Since his faculty appointment at Polytechnique Montreal in 2012, he has been pursuing these developments while setting up a lab environment for transferring knowledge to the local community.